Trans-X Symposium: A Symposium About Transmission Art :: May 25-27, 2012 :: Call for Papers — Deadline March 16. Rooted in the earliest experiments with radio, Transmission Art has continued to flourish with experiments with wireless communications technology over the past 100 years. The 21st Century is not excluded from this experimentation as artists have ventured into exploring a variety of mobile-based platforms and more lesser known forms of transmission such as VLF. The terrain of transmission art is dynamic and fluid, always open to redefinition. 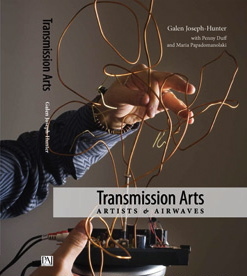 The Trans-X symposium, part of the Deep Wireless Festival of Radio & Transmission Art, will focus on transmission art, with particular interest in paper contributions that summarize, examine or reframe traditions and histories of transmission art practices, technology, education and pedagogy. Additionally, we are very interested in paper presentations that go beyond the local contingent to give a sense of what new technologies of international transmission activity might sound like. All symposium contributions will be webcast live, and text proceedings will be published on-line on the NAISA web-site.